This postcard is a companion, in two ways, to the "Pretty maids all in a row" postcard from September 2015. First off, the publisher appears to be identifiable only by the logo on the back, which features a raptor of some sort with a ribbon and some arrows (pictured at right). Second, the postcard features another short note from Auntie Em to Gladys. 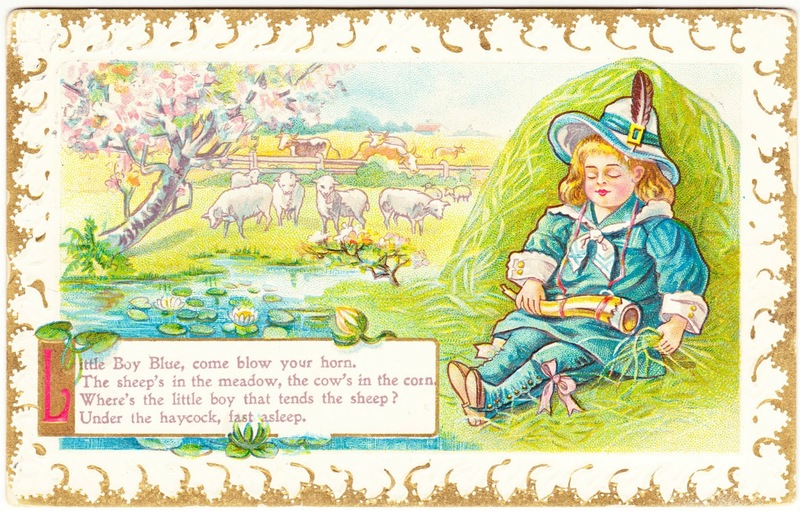 Where's the little boy that tends the sheep? Under the haycock, fast asleep. This postcard was mailed from Brooklyn, New York, and postmarked on August 11, 1910, a day on which the Philadelphia Phillies defeated the St. Louis Cardinals, 6-3, behind a complete-game effort by George Lemuel "Long Bob" Ewing. I'm mad at you, you never wrote me the Postal you promised me. Tell Auntie Mar little Johns papa did not see the man with the Boat as he has been very busy. But maybe we will take trip up for a day anyhow soon. Love to all & yourself from yours Lovingly, Auntie Em.